In 1835, during a banquet organized by the nascent Société Saint-Jean-Baptiste de Montréal, George-Étienne Cartier, aged 20, sang a patriotic tune he had just composed. Entitled Avant tout je suis Canadien, the song would become a source of inspiration for the militant political organization the Fils de la Liberté. Cartier himself fought on the side of the Patriotes at the battle of Saint-Denis on 23 Nov. 1837. However, with the Patriotes facing defeat, he was forced to flee and go into hiding for a time. Henceforth, Cartier was convinced that resorting to violence was not the solution to the colony’s constitutional problems, declaring in 1865: “We must either have a Confederation of British North America or else be absorbed by the American Confederation.” Several other British subjects in North America had been serving the cause, but few did it as well as Cartier and none did it better. One of the Fathers of Confederation, Cartier belonged to a generation of French Canadian politicians who made a significant contribution to the building of modern Canada. His life and achievements illustrate a number of aspects of Canadian, and especially French Canadian, political life in the 19th century. Like Jean-Charles Bonenfant, the author of his biography published in 1972 in Volume X of the Dictionary of Canadian Biography/Dictionnaire biographique du Canada, this thematic ensemble traces his journey from rebel to statesman while emphasizing the most important phases of his long public career. Early in his political career, Cartier conceived of plans and reforms that might lead to the creation of a new Canada. He was guided and supported in his thinking by people with whom he came into daily contact. Along with the section on his return to the law and the development of his social connections, the group of biographies devoted to his family, friends, and advisers highlights certain figures close to Cartier (Alexandre-Maurice Delisle, for example). Called to the bar of Lower Canada at the end of 1835, Cartier practised law at major Montreal law firms, including that of his first mentor in law and politics, Édouard-Étienne Rodier, and, later, with associates such as Louis Bétournay. Among Cartier’s clients were the Grand Trunk Railway Company and the Sulpicians, with whom he had studied. When the troubles of 1837–38 broke out in Lower Canada, Cartier was only 23. He had, however, already made a name for himself through his eloquence and his patriotic songs. Like Louis-Joseph Papineau, Robert Nelson, and others, he took part in the Patriote movement. Yet he rapidly distanced himself from it, as documented in a letter he sent in September 1838 to Charles Buller, chief secretary to Lord Durham. Cartier belonged to the group of players in the political life of United Canada who, between 1841 and 1867, succeeded in instituting reforms in the colony. In a political context where elections were often determined not only by reasoned debate but also by violence, Cartier fared well. A supporter of some form of responsible government, he became the trusted associate of Louis-Hippolyte La Fontaine in Montreal in the 1840s. Chronic government instability, resulting from the failure of political institutions created in the Act of Union to adapt to demographic and socio-economic changes, characterized these three decades. During the 25 years of his active political life, Cartier wielded great influence and authority in Canada East (Lower Canada; present-day Quebec). He initiated or supported numerous legislative and institutional reforms, including the reshaping of the municipal system, the abolition of seigneurial tenure, the creation of the Council of Public Instruction, and the codification of civil law. Cartier wanted his French Canadian compatriots to thrive. He also wanted the country to have social and political peace, and thus firmly believed that a healthy relationship among the various linguistic groups rested on the protection of minority rights. As well, Cartier maintained close relations with the authorities of the Roman Catholic Church and, following the example of individuals such as lawyer and member of parliament Gédéon Ouimet, he intervened in the crises that periodically shook the church; the decisions of both parties were sometimes influenced as a result. Yet Cartier’s manner, in the exercise of his influence, did not please everyone: some politicians, including Louis-Victor Sicotte and Thomas-Jean-Jacques Loranger, criticized his behaviour, which they considered blunt and authoritarian. Elected to the Legislative Assembly for the first time in 1848, Cartier worked to bring together Canada East and Canada West (Upper Canada; present-day Ontario). He was made a minister in 1854. That year he helped found the Liberal-Conservative Party, which became one of the main Canadian political groups of the mid 19th century. Motivated partly by their desire to find lasting solutions to political, economic, and social problems, the leaders of United Canada, with Cartier and John A. Macdonald at their head, developed scenarios for federating the British colonies of North America [see The Charlottetown and Quebec City Conferences of 1864]. Other public figures of the day, including the businessman and politician Alexander Tilloch Galt, proposed ideas for shaping the future Canada. There were many factors to consider. Access to the American and British markets varied according to economic conditions, among other things, so the domestic market had to be enlarged and stabilized by extending the east–west commercial axis – hence the importance of building a railroad along that axis. Protectionist tariffs for national industries would also be required. Furthermore, the plan for federal union had to put forward an equitable sharing of the public debt among the provinces. This last point, especially, led to resistance by legislators from the Maritimes [see Opposition to Confederation], who feared bankruptcy and parliamentary under-representation. At the same time, Cartier, who was contemptuous of the “liberal” political institutions and values of the United States, attacked the ideas of the annexationists [see Sir Antoine-Aimé Dorion; David Kinnear; John Redpath; John Torrance] and used the American Civil War (1861–65) as an additional argument to persuade the undecided of the urgency of uniting the colonies. On 1 July 1867 Cartier was among those who took their seats in the parliament of a new country: the Dominion of Canada. He was one of the Fathers of Confederation, who laid the institutional foundation of a federal system characterized by the sharing of powers between a central government and provincial governments. Yet the British North America Act did not settle everything. With the goal of watching over the interests of his French Canadian compatriots – whose demographic weight was decreasing within confederation, but who had played a fundamental role in building the country – Cartier took it upon himself to intervene in matters of jurisdiction on behalf of his native province; his dual responsibilities as a federal–provincial legislator gave him room to manoeuvre in this regard. The section on Cartier and the political direction of the province of Quebec describes these transactions, including his close contacts with influential personalities such as Sir Narcisse-Fortunat Belleau and Hector-Louis Langevin. Cartier was given the portfolio for militia and defence in Canada’s first cabinet. Assisted by civil servants and members of the military and police force, such as George Futvoye, Patrick Robertson-Ross, and Frederick William Ermatinger, he undertook major reforms of the military. He was also interested in westward territorial expansion, the economy, and transportation. On these issues, political decision makers felt a sense of urgency. Cartier therefore encouraged certain individuals, such as Joseph Dubuc and Marc-Amable Girard, to settle in Manitoba to ensure the presence of young professional francophones in that province, which was created in 1870. The colonization of territories west of Ontario was inescapably linked to relations with native peoples and the Métis. In the months preceding the creation of Manitoba – a territory shaken by a rebellion led by the Métis Louis Riel – Cartier had had discussions with Alexandre-Antonin Taché, the bishop of Saint-Boniface. Together, they attempted to find solutions to problems which, among other things, affected the Métis’ quality of life and contributed to the deterioration of their relations with new Anglo-Protestant arrivals. The difficulties were various and concerned boundaries, territory, religion, and language. In 1871 Cartier secured the Canadian parliament’s approval of the address calling for the entry of British Columbia into confederation with the promise to build a railway to the Pacific. As early as 1849, Cartier had declared his interest in the question of public transportation, especially railways, in which he was to invest his own capital. Accused by his opponents of being the “liegeman” of the railway entrepreneurs, Cartier became, together with Toussaint Trudeau and Asa Belknap Foster, one of the major players in this industry, which was vital to a country whose territory and population was rapidly increasing. Cartier and other 19th-century Canadian politicians were involved in controversy and scandal. They were motivated in part by the desire to enrich themselves and to back their own supporters, and corruption and favouritism regularly found their way into their strategies, notably during the implementation of large government projects. Cartier was involved in one of the biggest disgraces in Canadian political history: the Pacific Scandal (1872–73) [see John Hillyard Cameron; Lucius Seth Huntington]. Among other things, he personally received tens of thousands of dollars from the business and industrial magnate Sir Hugh Allan, which was paid to ensure that the government would award the contract for building the Canadian Pacific Railway to his consortium. 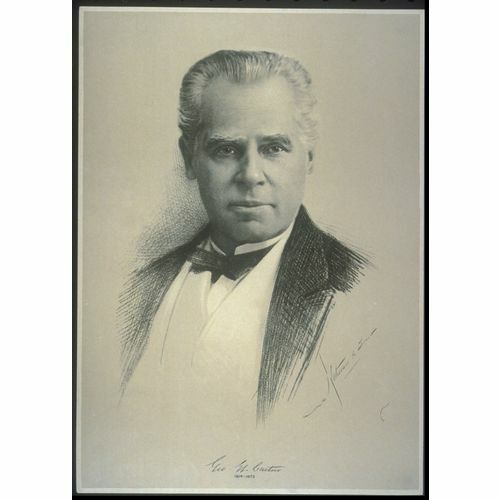 The biographies included in this project on the life of Sir George-Étienne Cartier contain much information on an important period in Canadian history and on a major politician. We invite you to learn about this man, about a number of others, and about topics on which Cartier’s story sheds light.